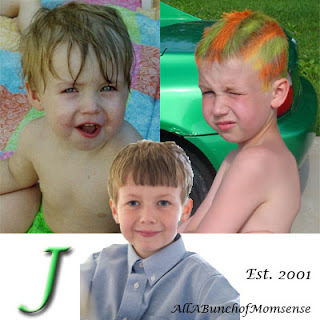 So, if I'm going to mommy blog, I think there should be a bit on each of the kids! Over the next few days, I'm going to share a little background on each of my 3 yahoos! We're going to start with J. Our oldest child, he is quite possibly the most stubborn personality I've ever encountered. My husband and I had been together for about 2 years when we learned that we were expecting. We were not yet married, and were in the process of purchasing our first house, after which we were going to begin planning our wedding. God had other plans! I first began to suspect I was pregnant in August of 2000. I was putting on a little weight, noticing that my clothes didn't fit quite right. I had taken a vacation with a couple of girls in July, and had used my birth control to move my cycle, something I had done many times before with no issues. When I was late with the August cycle, I figured that either it was still readjusting OR that we were looking into a little one. I gave it a couple of days, and then I bought a "stick". It took mere moments for that stick to reflect 2 very dark, obvious lines. I was pregnant. Nervous, excited, afraid, unprepared, but for better or for worse, we were having a baby! We scheduled our first OB appointment for on my birthday in September. Based on what I figured, I should have been right at about 8 weeks at that point. I peed in the cup, I did the initial bloodwork, and then they took me in for my "peanut picture" ultrasound. We couldn't wait to see that little white dot. Only, it wasn't a little white dot. It was a baby. The technician, who's sons were friends with my brothers, said to me "You think you are HOW far along?" Eight weeks. I was eight weeks. She clicked, she drug, she measured. She clicked some more. And then she said to me "Megan, you're measuring at about 18 weeks. Do you want to know what you're having?" I nearly fell off the table. I couldn't be 18 weeks pregnant! I'd had regular cycles, I was on the pill, I HAD HAD MARGARITA NIGHTS AT MY HOUSE EVERY FRIDAY ALL SUMMER! But, then and there my plans for a late-April birth were smashed upon the floor, and I was told that I would have a baby boy in Mid-February. I had a marvelous pregnancy. While I was physically tired for a bit, overall, I felt fantastic. I never suffered with morning sickness, all of my checkups were great, and despite my fears over Margarita Nights, I seemed to be carrying a perfectly healthy baby boy. J made his appearance into the world on a Saturday afternoon, where he was welcomed by grandparents, great-grandparents, uncles, and a slew of friends, not to mention his mommy and daddy. He was a marvelous baby, our only real challenge was with latching for nursing. We worked around it, providing him with bottles of my expressed milk until, at about a month old, he got it down. That was in 2001 - since that time, he's been mommy's helper with his brother and sister, he's broken his arm twice, scared me to death with a round of the flu in 2003, been the first to head off to school on a bus in 2006. He's suffered from migraines since very early childhood, as I did. He is incredibly bright, loves to read, hates math. He's as sarcastic as they come, which his teachers find hilarious. While I'm sure there will be so much more to come, and there's so much more behind us, that's a quick highlight of my J! it was so touching to read about your oldest...truly adorable!!! Hi there! Thanks for stopping by my blog....yours looks great! I won't lie, it really freaked me out! I laugh now when I watch those "I didn't know I was pregnant" shows- while I didn't make it to term, having sort of been there done that, I SOOO get it. Thanks for the compliment on the blog - I've been playing with the layout and such, so I really appreciate the feedback!